Come and celebrate the end of another year and looking forward to the holidays. If you can’t come along, we hope you have a safe and enjoyable end to your year and a positive start to the new year. We look forward to seeing you again in 2018! 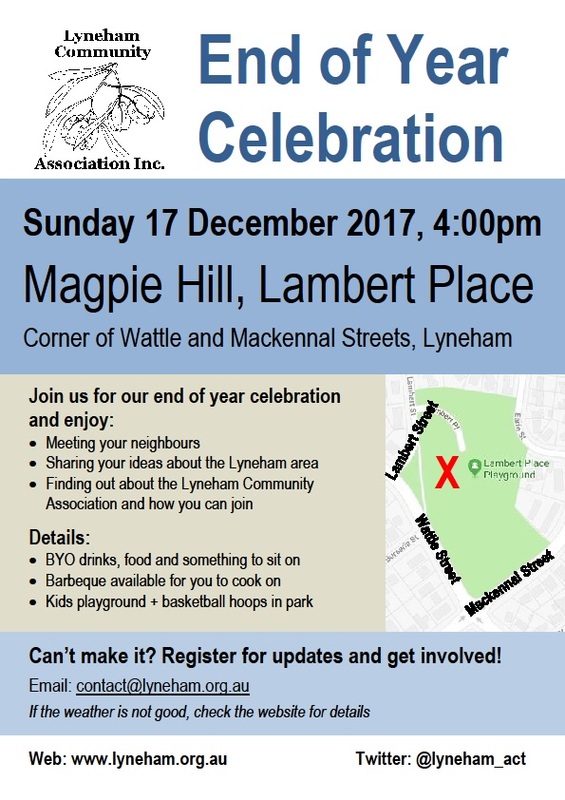 Finally, thank you to all those who have contributed to the Lyneham Community Association this year. We achieved lots for Lyneham, starting with the wonderful Summer Soiree in February, Light Up Lyneham in July, stall at Lyneham Primary School Fete in October, engagement with Government about a range of Lyneham issues throughout the year, a survey and gathering of ideas for improving Lyneham, and much more. See you at the celebration or in the new year.